This post is part of a social shopper marketing insight campaign with Pollinate Media Group™ and Jimmy Dean, but all my opinions are my own. #pmedia #onthego http://cmp.ly/3/8vNxcO. 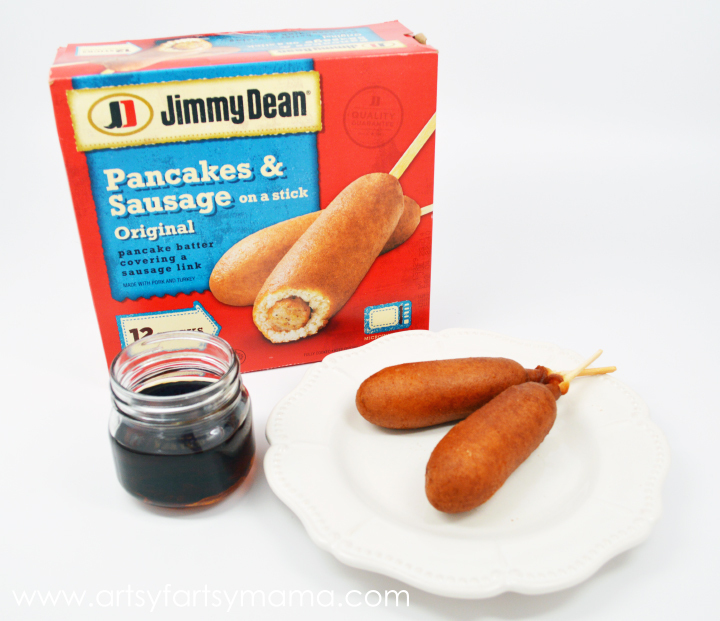 I've shared a lot of recipes for easy, quick dinner ideas, but today I'm going to share one of my family's favorite on-the-go breakfasts: Jimmy Dean Pancakes and Sausage on a Stick. Yes. On a stick. I love that they are an easy option for families who are rushing out the door early in the morning and need something sustainable for breakfast, and kids love them! 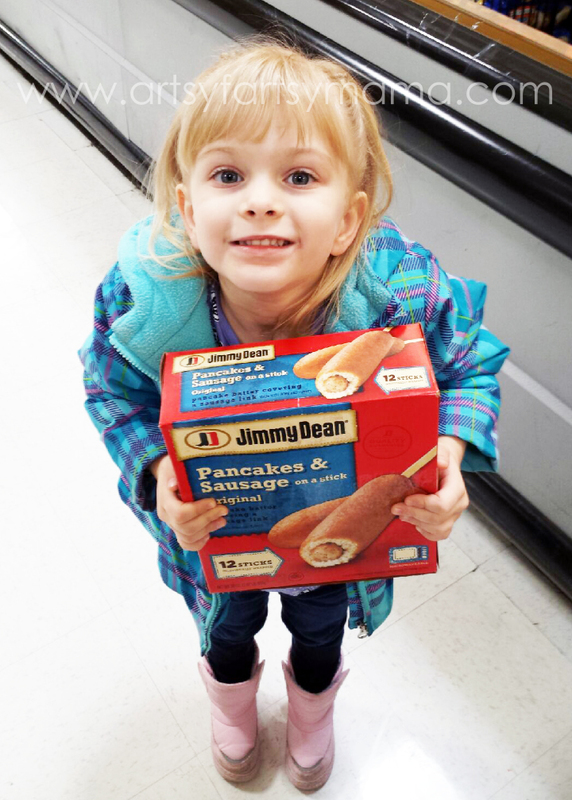 We found the Jimmy Dean Pancakes & Sausage on a Stick at our local WalMart in the frozen section (just FYI, in February they will move to the BREAKFAST aisle). My daughter was so excited that we were going to bring them home that she decided to carry them herself throughout the store - just in case mom or dad decided to put them back! She is pretty picky with her food, so seeing how happy she was makes me think that these will probably become a staple on our grocery shopping list. Honestly, I think these are genius. Think corn dogs, but breakfast style! Fluffy pancake on the outside, yummy Jimmy Dean sausage on the inside. They can be cooked in the oven or the microwave. I prefer the oven so that the outside gets a little crispy, but my husband prefers that they be cooked in the microwave. Either way, they are delicious and are cooked in a matter of minutes. At our house, no breakfast food (except cereal) is complete without maple syrup. These Pancakes & Sausage on a Stick are perfect for dipping, and the maple flavor really goes well with both the pancakes and the sausage. Any maple syrup will do, but I also wanted to share a super simple maple syrup recipe that is SO much easier than you'd think. Plus, you will save SO much money making it yourself!! Pour the water and sugar in a saucepan and cook over medium heat. Stir constantly until the sugar is dissolved. Add the corn syrup and stir until the mixture starts to boil. Remove from heat and add the maple flavoring. Stir until mixed thoroughly. 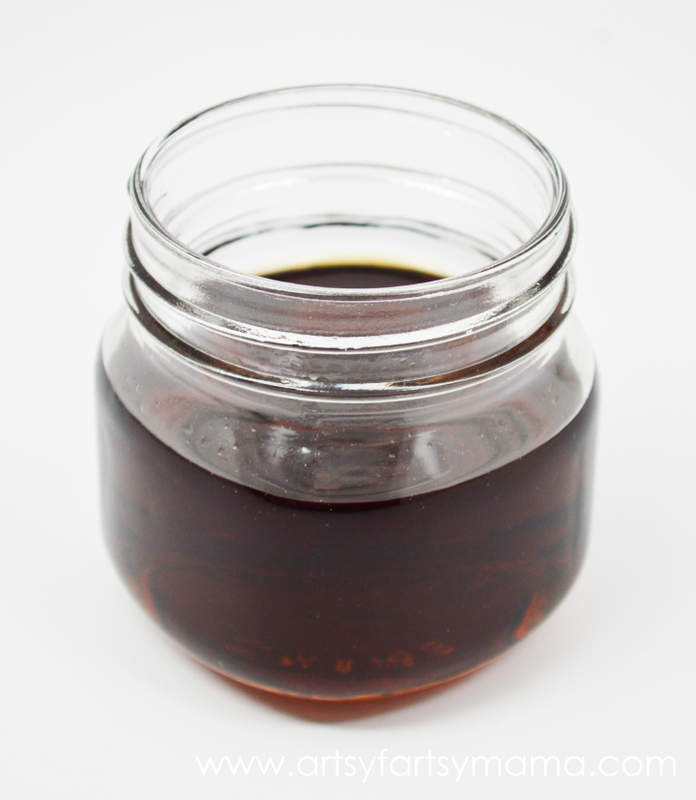 While still hot, pour the syrup into a container for storing (like an empty syrup bottle) or a mason jar. This recipe will fill one 16 oz jar. Store like regular syrup (room temperature or refrigerator). For more Jimmy Dean, follow them on Facebook, Twitter, Pinterest, and Instagram! What the what?? 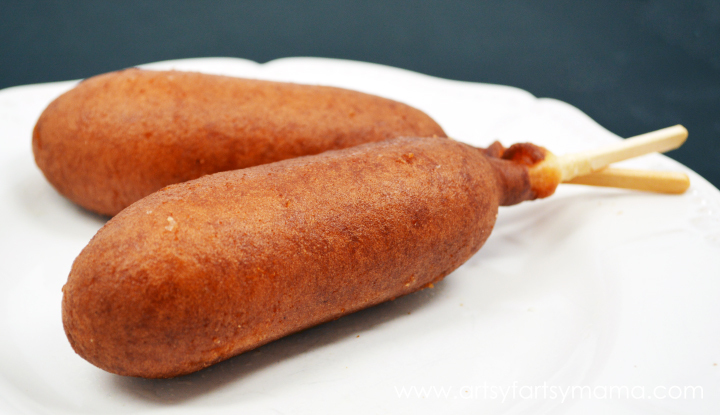 BREAKFAST CORN DOGS?? I am all over this idea!! I love all things Jimmy Dean! Their Egg Delights are my favorite right now because I'm on a healthy kick! We haven't tried these yet but I know my daughters will love them! Thanks for sharing! OMG this looks absolutely delish on this cold morning! I've never made my own syrup before, but I think I should definitely give it a try! I need to go pick up some of those sausage corn dogs as well. I bet my girls would love them for breakfast! My daughter would love these! And we are definitely Jimmy Dean fans in our house! Jimmy Dean is always high on my list. I had no idea there was such a thing as breakfast corn dogs! I need to pick some up ASAP. I'm sure they will be a big hit with your homemade maple syrup! We love making our own syrup. This looks like the perfect combination! I've been curious about these. I think I'll have to grab some. I love Jimmy Dean products. These are perfect for on the go. I think I saw your pic on instagram or something a few days ago - but corn dogs are one of my favorite (guilty pleasure) meals ever - breakfast style corn dogs? These sound and look amazing! 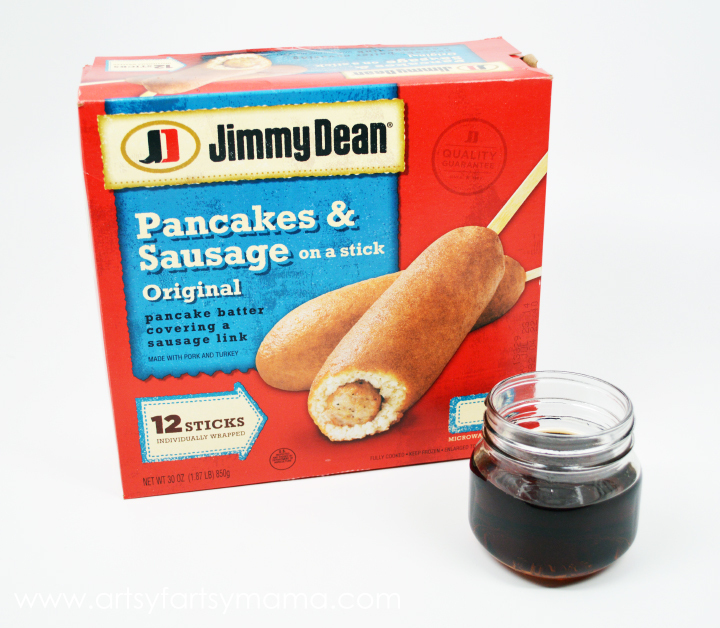 I love the combo of the sweet and salty, and I love dipping my sausage in syrup, so I can't wait to try these ones out! My kids love these (and so do I) I love your recipe for homemade syrup! I make homemade syrup all of the time and just love it! Whoever came up with this was a Mom having to get her kids acceptably out the door for school on time in the morning! :) We've gotta try these- too many mornings I realize my little guy ate two bites and nothing else! I haven't tried those yet, but they look so good & thanks for sharing the maple syrup recipe! Yum...to Jimmy Dean and kudos to you for the homemade syrup idea! Great post fellow Pollinater! I love corn dogs - I bet I would love these! Lol at Adrianne's comment...breakfast corn dogs! :) Gotta love that! I haven't made homemade syrup in a long time. Need to make some very soon.